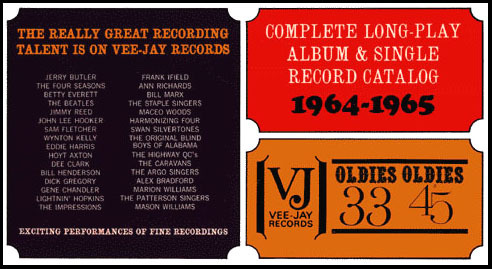 This is the cover of the Vee-Jay Records 1964-1965 catalog, the one advertised on the back of the Hear the Beatles Tell All album. Extremely scarce, only a few copies are known in collectors hands. 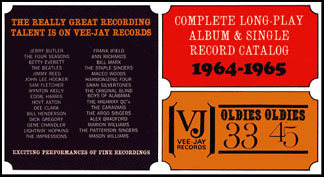 This copy was kept by Randy Wood, the president of Vee-Jay Records in the 1960s, and later given to premiere Beatles collector, the late Gareth Pawlowski.